Deep Impact - Solar System Planets And Moons Section. Deep Impact began its engine. Deep Impact began firing its engine for 14 minute. Deep Impact Smashes Into Tempel 1. NASA's Deep Impact mission completed its primary goal July 4th, when its impactor spacecraft smashed into Comet Tempel 1. NASA scientists are eagerly reviewing the impact data captured by the flyby spacecraft to learn what size crater was excavated, and the kind of material ejected into space. The 373 kg (820 lb) copper impactor crossed paths with Tempel 1 right on schedule, at 0552 UTC (1:52 am EDT). More than 60 observatories on Earth and in space were on hand to watch the collision and help gather data. As expected, Comet Tempel 1 was entirely unfazed by the impact, and hasn't changed its orbit in any detectable way. NASA's Deep Impact spacecraft released its impactor "probe" Sunday morning, and changed its trajectory to pass a comfortable distance from Comet Tempel 1. 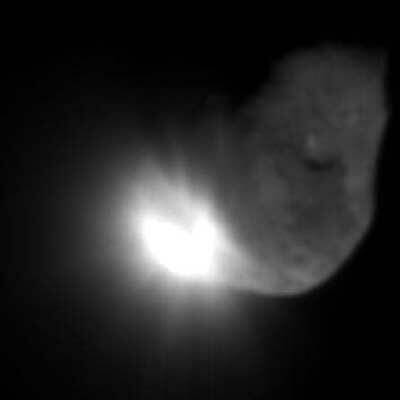 When it was released, the impactor was 880,000 km (547,000 miles) away from Tempel 1. After releasing the impactor, Deep Impact began firing its engine for 14 minutes, which slowed down, and kept it out of the path of the onrushing comet. If all goes well, the impactor will strike Tempel 1 on Monday, July 4 at 0652 UTC (1:52 am EDT).